Game description: Gauntlet's hack-and-slash gameplay continues in Gauntlet: Dark Legacy. You and up to three of your friends must work as a team through eight dangerous worlds. As one of eight different characters, you'll vanquish creatures, evade traps, and search for treasure. Character-based power attacks, magic potions, new power-ups, and combination moves add to the mayhem. The game save system allows players to transfer evolving characters from their own machine to a friend's to take on the dungeon together. 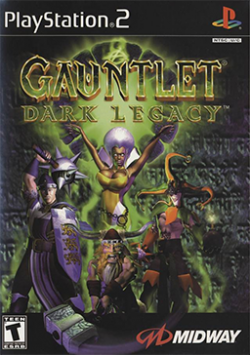 It is an expansion of the previous title in the series, Gauntlet Legends. The expansion adds four new character classes: Dwarf, Knight, Jester, and Sorceress, and five new levels. It also adds a large number of secret characters, some of which can be unlocked in the game, others only accessible by entering specific cheat codes. This page was last edited on 19 January 2018, at 21:22.